and other functions such as sin(x) which have non-infinite ranges and are defined for -4<x<4. 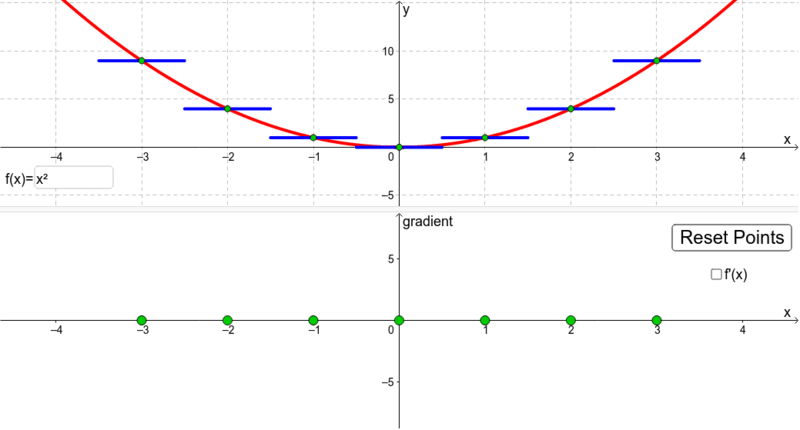 Move the green dots on the lower half to approximate the gradient of the tangent to the curve (aka. the gradient of the curve) at the seven given points. Change the function f(x) using the input box in the upper half. Reset the gradients of the tangents to zero using the "Reset Points" button. Display the gradient function using the f'(x) check box.